32 years of dentistry for your family and friends! Thank you for taking the time to browse our site and learn more about our practice. Dr. Sauber has 32 years of experience taking care of the dental needs of your family, friends and neighbors. His dedicated team has over 100 years of combined experience as well. We are proud to be able to offer our patients a wide variety of dental services with expertise and confidence. Dr. Sauber has perfected the painless injection for the most comfortable and relaxing experience available. The office utilizes modern equipment and the latest technology to make your experience effortless and stress free. 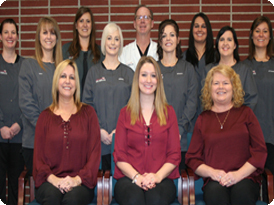 Making your dental experience comfortable is the top priority of this Dental TEAM. Dr. Sauber uses a TEAM concept to make your dental experience friendly, efficient , pain-free and affordable. Get to know our Dental TEAM by visiting them at Meet the TEAM . Select from the menu to the left to learn more about the office and help you get connected. Here are a couple of our results from last years Zoom special. Current price is $399. Call the office today to make an appointment and learn how you can have a whiter smile in just over an hour.